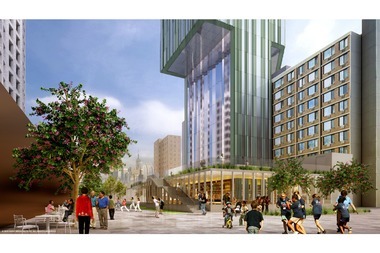 LOWER EAST SIDE — Waterfront residents are pushing back against a developer’s plan to erect a 77-story apartment building next door to an already rising 80-story tower, expressing fears that more construction will worsen noise, quality-of-life and density issues. A flood of protests awaited the JDS Development Group and ShoP Architects on Wednesday when they met with tenants of the Two Bridges Towers at 82 Rutgers Slip to discuss the proposed mixed-income tower slated for 247 Cherry St., located directly next to Extell’s controversial One Manhattan Square. Residents at the meeting said they fear the impact a saturation of construction and development will have on their community. The mixed-income tower at 247 Cherry St. would include a landscaped courtyard. The new development — first revealed in an exclusive meeting with The Lo-Down prior to Wednesday’s meeting — will bring 600 residential units to the community, 150 of which will be made permanently affordable. Unlike the Extell development, which will include a separate building for below-market-rate tenants, the affordable units will be scattered throughout the building, reps said. The Two Bridges Neighborhood Council and Settlement Housing Fund, which own 82 Rutgers and the neighboring senior apartments, sold the property to JDS for $51 million and are involved in the planning and development process, which they say will ultimately benefit the community despite short-term inconveniences. As part of the community benefits rollout, the neighboring senior apartment building will be getting a handful of much-needed improvements, including a renovated lobby and new flood-proofing resiliency upgrades. The development will also include retail space — which may be a grocery store, based on community feedback — and the tower’s first floor will hold a sprawling community center open to all residents. The complex will also introduce a rooftop garden and a landscaped outdoor space, according to reps. The president of Settlement Housing assured residents the addition of much-needed affordable housing and community benefits will make the development a boon to the neighborhood, despite fears the influx of units will overwhelm and irreparably alter the longtime community. “There will be 450 units of market rate rentals — is that a change for this neighborhood that is primarily affordable? Yes, it absolutely is,” said Alexa Sewell. “Is it a make or break for a neighborhood with thousands and thousands of units of housing? No, it is not." Still, tenants of 82 Rutgers insisted the silver lining will in no way compensate for the inconvenience of ongoing construction and the perceived ills that could come from so dramatically increasing density in a relatively small area. The looming tower will block their sunlight, many tenants said, and the neighborhood’s infrastructure is simply not built to accommodate such numbers. Furthermore, the community benefits outlined neglect the needs of the existing tenants, who said they have been living with damages from the Extell construction as well as normal wear-and-tear and have had no luck securing necessary repairs. Many other tenants spoke out about the cracks in their ceiling and broken windows that have come about as a result of the neighboring construction and have gone unfixed despite pleas to building management. 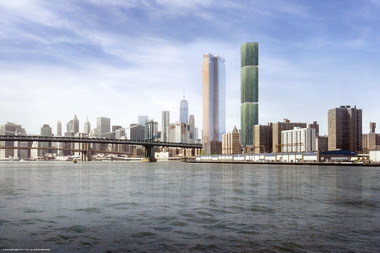 Sewell stated that while many superficial damages like cracks — which have no structural impact and pose no danger to residents — may have to wait until after the tower’s construction to avoid repeatedly addressing the same repairs, the building will work to immediately address structural damages that pose a threat to health, safety, and quality of life for residents. Other improvements to 82 Rutgers, such as flood-proofing in case of another superstorm, will be assessed after the tower’s completion, said Sewell, who assured residents the profits reaped from the development will be funneled into improving the building. The neighborhood council and Settlement Housing will aim to meet with residents within the coming week to address emergency repairs, said Sewell. Sewell, along with JDS CEO Michael Stern, also stated they would work to minimize the inconveniences that will inevitably come with the construction — set to kick off in roughly two years — and will keep an open line of communication with residents to ensure the least amount of disruption possible. As for the neighboring Two Bridge Senior Apartment building at 80 Rutgers Slip, which had a separate meeting with developers earlier on Wednesday afternoon, the full impact of the project on the elderly has yet to be seen. The construction may necessitate temporarily relocating several senior tenants, said Sewell, though future vacancies in the center may allow them to relocate to different units within the same building.